Human trafficking is a tough subject in youth ministry. There are a lot of things to consider when talking about it. The obvious age and developmental considerations of the people in your group are there. And there are also cultural and parental expectations when we discuss issues of a sexual nature with someone else’s kids. Wisdom and discernment are our friends as we decide when it’s good to begin engaging them in conversations about human trafficking and what it means to live and act as an anti-trafficking advocate. The first resource I used in youth ministry that addressed the topic was called “The Justice Mission”. Looking back, I probably shouldn’t have focused on the topic for eight plus weeks in a row. A more integrated strategy probably would have been more helpful for the group in my care and for the parents who I had hoped to partner with. Even in my zeal and lay it on thick approach, it was an exceptional curriculum that spoke to hearts about what it meant to speak and act on behalf of the oppressed, whoever it may be. It inspired kids to care about what God cares about. Because it’s a sensitive subject, one that shouldn’t be thrown out there lightly, but also one that can’t be ignored, i’s important to try to integrate the efforts into the greater conversation of the Church. Inter generational ministry is at it’s best when kids and adults can learn and grow together. Right now, I’m working on developing something called “The Justice Movement”. The movement will host a variety of things that churches can do to interrupt cycles of injustice around them, including things teenagers and the wider church can do to fight human slavery as it exists today. One of the items you’ll see on our website (eventually) will be resources for your youth groups to participate in Freedom Sunday. Right now, they are available for the entire church to be engaged. Freedom Sunday is February 22. And I am so excited that we have stuff to teach our kids how to be loving advocates for those who do not have a voice yet. I recommend talking to your church leaders about partnering with the youth ministry this year. 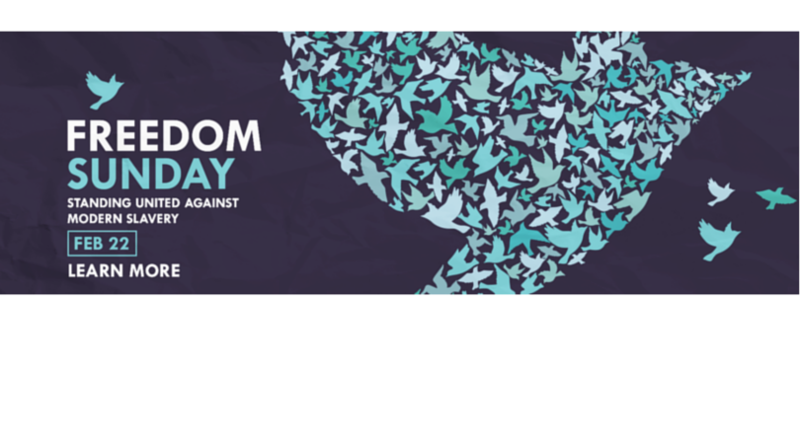 There is also a link to register your group to participate in Freedom Sunday, click here to learn more. We hope that kids in our ministries will continue to recognize their part in the bigger picture of God’s redemption for the world. The just move, even when it’s intimidating, even when our efforts feel small compared to what others seem to be able to do. Every move. Every injustice uncovered with the searchlight of Jesus’ love is an interruption in the cycle that shouldn’t exist. Every holy interruption pushes out what shouldn’t be. Please share how your youth ministry is engaging the conversation of modern slavery. I would love to hear your ideas and thoughts. Where can i find prayer guides in spanish?